HICKORY, N.C. - Despite out-hitting the Crawdads 9-to-5, the Intimidators surrendered three home runs to Hickory Saturday night, losing 6-5 in 11 innings at L.P. Frans Stadium. 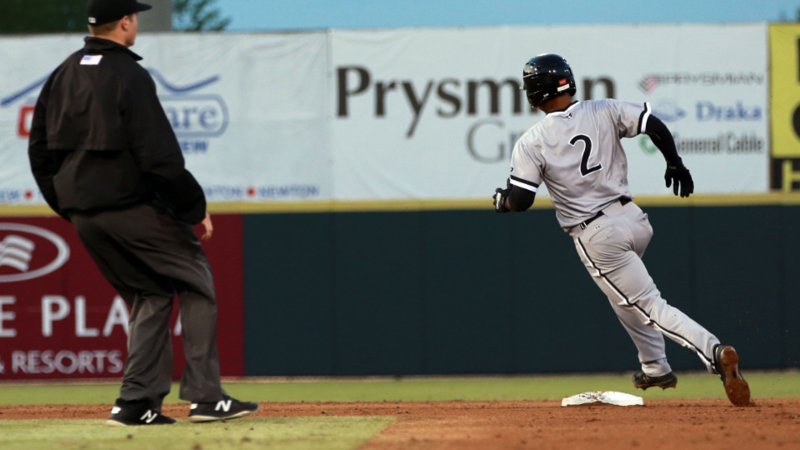 With the Intimidators down 4-1 and down to their last out in the ninth inning, Luis Curbelo cranked the Intimidators' first home run of the season to right field, scoring Amado Nunez and Gunnar Troutwine to tie the game, 4-4. Holding off the Crawdads in the bottom of the ninth, the Intimidators scored one in the tenth but allowed Hickory to score one in the inning to send the game into the eleventh. In the last frame, the Crawdads used a double to score the game-winning run. In the second inning, Troutwine of the Intimidators rifled a ball to left-center with one out, coming into second base standing up, bringing up Curbelo. On an 0-1 pitch to Curbelo, the Puerto Rican shortstop hit a grounder to second baseman Jonathan Ornellas, as Ornelllas watched it go directly through his legs, allowing Troutwine to score with ease from second base. Down by one run in the third, Pedro Gonzalez smacked his third home run in as many days for the Crawdads, tying the game, 1-1. After giving up the solo-shot, Konnor Pilkington went on to strike out eight batters over the next three innings, capping off six solid innings on the bump for Kannapolis. In the seventh inning, Matt Whatley for the Crawdads walked to lead off the inning, as Curtis Terry unloaded on a ball to right-center field off Vince Arobio, giving the 'Dads a 3-1 lead. Next up, Sherten Apostel hit a line-drive home run to left field, increasing the Hickory lead to three, up 4-1. After tying the game in the ninth and losing in extras, the Intimidators are now 0-2 in extra-inning games this season. Kannapolis and Hickory will battle to get in Sunday's game with Mother Nature at 3:00 p.m., as RHP Kade McClure will take the mound against Hickory's RHP Tim Brennan.